I have two friends named John and Julie. 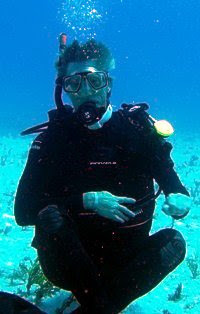 John's an ichthyologist and is as often underwater as on dry land. Julie's a writer (formerly a reporter for the Raleigh Observer and on the Internet with Streetmail) and the public relations person for the North Carolina Aquarium in Pine Knoll Shores NC. The couple are also avid home gardeners. They inform their admiring friends about the first ripe tomato in the garden and take ribbing about "What-no engraved announcements?!" Peas are Julie's particular pride and joy. 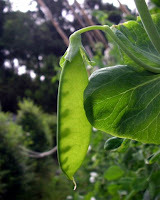 She snaps pea portraits and then sautes them with garlic. She regards radishes as opportunities for artistic expression. Recently John and Julie made a quilt. Julie sent me the story of the quilt and since I cannot improve on her writing, the story follows unedited. I found the pieces for this quilt in a box put out for trash pickup six or seven years ago. Somebody had obviously cleaned the attic or the closet. I knew (know) nothing about quilting, but I couldn't stand to see all that history and handwork thrown away. Even if the 1940s/50s – era squares were startling to behold: vivid prints paired with dark pink/navy hounds tooth diagonals. I think you called it a “North Carolina” pattern and said people had stopped using the pieces in a pinwheel design after WWII because it too closely resembled swastikas. That still left plenty of options – too many for me, it turned out. I played with the parts for awhile but the box eventually ended up in the same closet with my Christmas decorations. Every December I’d come across it and ponder how to put this quilt together. The challenge was both logistical, as I had no quilting experience, and artistic. A few particularly arresting prints dominated the collection, while others were one-of-a-kind. I am not a visual thinker, and my unimaginative tendency for symmetry in such matters was no match for all this disparity. Then John and I finally finished tiling my enclosed porch’s floor – I had bought the tiles about the same time I found the quilt parts. His demonstrated talent for working with square things and propelling stalled projects forward inspired me to ask for help. John is anything but a slave to symmetry, and he was predictably enthusiastic. We went to work one winter weekend, arranging, photographing for future reference, then rearranging. We came up with probably 20 variations over a week of experimentation. We would finally agree that a certain rendition was the best we could do. And a half-hour later, we’d be back, trying yet another design. Finally, we declared it over, done, finished for the last time and made a pact that neither of us would change it again. I fell asleep in front of the fire and when I woke up a half-hour later, I heard a soft rustling as John rearranged the pieces. I had to admit he improved it. The next morning while he slept in, I did my own final adjustments, and he also conceded they made it better. We swore another pact, and I got out the sewing machine to make sure this one held. Turns out, it didn’t but only because of a couple of small inadvertent mix-ups in the sewing process. As I sat at the machine, I couldn't help but think of the quilter who had done all the work by hand. Who had spent all that time putting those little pieces together? What kind of design did the maker have in mind? Why did it get set aside for so long? I had a feeling the originator would be pleased that finally there was some movement. I wasn’t entirely sure I could complete it, daunted as I was by backing and batting and the actual quilting. This stage got even more complicated when we decided to recycle an old comforter for the batting and an orphaned purple bed sheet for the backing. My workmanship will not win any prizes, but I finally managed to stitch it all together. The finished product is indeed proof of the phenomenon that the sum is sometimes greater than the parts. The pink and navy and purple are rarely repeated or even complemented in the flowered, striped and geometric prints that John fondly describes as “bilious.” Yet it all works together for a pleasing result. John and I are full of self-congratulatory pride for the rescue and release of the long-dormant creativity – and frugality -- that went into the squares decades ago. Our wacky design is less outlandish than he would have rendered alone and less pedestrian than I could have produced solo. And, of course, there is always the aura of mystery surrounding our third, unseen collaborator. It’s warm, functional and fun, and we love telling its story. That’s part of the definition of “quilt,” isn’t it?